BACKGROUND: Nephroblastoma is one of the most common childhood malignancies in Africa, but with a survival rate significantly lower than in developed countries. In African countries with a small gross domestic product (GDP) per capita, the cost of treating nephroblastoma may be prohibitive. OBJECTIVES: To determine the direct costs of treatment of nephroblastoma in South Africa (SA) and to propose a more cost-effective approach to investigations and treatment for the disease in Africa. METHODS: Data from 2000 to 2010 from two SA paediatric oncology units were retrospectively analysed. The costs included investigations, chemotherapy and radiotherapy, comparing early- v. advanced-stage disease. In both units, the nephroblastoma International Society of Paediatric Oncology (SIOP) protocol was used. RESULTS: Stage I disease was the most common, followed by stage IV. The total cost of diagnosis, staging and treatment of stage I disease was ZAR9 304.97 (EUR882.80 or USD1 093.40), compared with a five-times higher cost for stage IV (ZAR48 293.62 (EUR4 581.9 or USD5 674.9)). Treating one patient averted more than 32 disability-adjusted life years. The investigation and treatment of early- and advanced-stage disease is very cost-effective when compared with the local GDP per capita. CONCLUSION: The cost of investigation and treatment of nephroblastoma remains a challenge everywhere, but especially in Africa. However, it is a very cost-effective disease to treat and children in Africa should not be denied treatment. Nephroblastoma or Wilms' tumour is one of the most common childhood cancers in Africa. It represents ~6 - 7% of childhood cancers in high-income countries, but up to 26% in some African countries. In First-World countries, it has a high cure rate of >90% when treated with chemotherapy, surgery and radiotherapy, compared with disappointing results in low-income countries. [3, 4]There are currently no data on the costs of treating nephroblastoma in children in Africa. On a continent where gross domestic product (GDP) figures per capita, excluding South Africa (SA), rarely exceeds USD2 000 (United States Dollar), and in many countries in fact is less than USD1 000, the expenditure incurred by the standard management of this disease in children may be unaffordable. 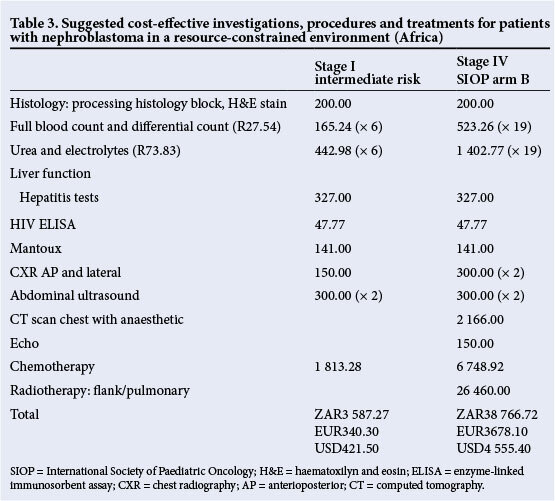 This study proposed to estimate the cost of managing nephro-blastoma, based on data available from two paediatric oncology units (POUs) based in Cape Town and Bloemfontein, and to critically evaluate the various cost contributors in order to find ways of reducing the cost of treatment without compromising remission or survival rates. The specific objectives of the study were to: determine the total number of children diagnosed and treated for nephroblastoma between 2000 and 2010 in the two POUs; correlate the stage of disease with survival; quantify the resources used in the diagnosis, staging and treatment; compare the costs of treating a patient with an early-stage nephroblastoma (stage I) with a patient with metastatic disease (stage IV); and propose a more cost-effective approach to investigation and treatment for children diagnosed with nephroblastoma in Africa. Patients aged 0 - 15 years, diagnosed with nephroblastoma between 2000 and 2010 at Tygerberg Hospital (TBH) in Cape Town and Universitas Hospital Academic Complex (UHAC) in Bloemfontein, were included in the study. TBH is a tertiary referral hospital located in Parow, Cape Town, serving the eastern metropolitan region of Cape Town and the north-eastern districts of the Western Cape Province. The hospital, being the largest hospital in the Western Cape and the second largest hospital in SA, provides healthcare to 2.4 million children. This POU admits an average of 50 - 60 new patients per year. The UHAC is situated in Bloemfontein and provides cancer care to patients in central SA, and is the referral POU for the whole of the Free State and Northern Cape Provinces, Lesotho, as well as for some areas of the North West and Eastern Cape Provinces. The unit sees ~100 new oncology patients per year. The treatment protocol used in both units for the treatment of nephroblastoma was the International Society of Paediatric Oncology (SIOP) 1987, followed by SIOP 2001. The SIOP protocol is based on the administration of preoperative chemotherapy prior to the surgical resection. The National Health Laboratory Service confirmed the histological diagnosis in all cases where a surgical resection was performed. Some patients who died before surgical excision were diagnosed clinically or on typical radiological findings. Radiotherapy included flank and pulmonary irradiation. Staging tests were performed initially in order to make the diagnosis and to establish whether there was metastatic disease or bilateral disease. An abdominal ultrasound was followed by a computed tomography (CT) scan of the abdomen and, in many cases, by a fine-needle aspiration. Chest radiography (CXR) was part of the initial assessment and was complemented by a CT scan of the chest, mostly in cases with suspected pulmonary metastases. Magnetic resonance imaging (MRI) of the abdomen was occasionally performed on request of the surgeons, to assist in planning the surgery and also at one of centres based on the choice of the radiology department, owing to less radiation exposure. Patients who were not staged included those who died soon after admission or failed to proceed to surgery. The costs of staging investigations as well as the cost of treatment were obtained from the various hospital departments involved, i.e. pharmacy, radiology, radiotherapy and laboratory, at 2012 tariffs. The cost of all investigations is the same at all SA government institutions. Patients <6 years old receive all investigations and treatment free of charge. Patients >6 years old are categorised according to the parents' monthly income, and the family has to pay a percentage of the total cost depending on the category. Patients >6 years of age who receive a care dependency grant from the government are also exempt from all cost. This analysis excluded the expenditure incurred for hospitalisation, dispensable stock used (e.g. syringes, needles, drip sets, etc. ), and surgical and theatre costs. The costs presented were based on the calculation of expenses as for the stage I intermediate group as the most common in our group, and the stage IV group as possibly the most expensive treatment. The currency used was the SA Rand (ZAR). Conversions to the USD and Euro (EUR) were made at the 2012 exchange rate at the time when all costs were determined (1USD = ZAR8.51; 1EUR = ZAR10.54). To calculate the mortality and morbidity effect of nephroblastoma on the population, disability-adjusted life years (DALYs) were calculated. The cost-effectiveness of the relevant investigations and treatment described were determined according to the World Health Organization (WHO) CHOICE guideline. The CHOICE (CHOosing Interventions that are Cost-Effective) project is a WHO initiative developed in 1998 with the objective of providing policy makers with evidence for deciding on interventions and programmes that maximise health for the available resources. To quantify the mortality and morbidity effect that a disease has on a population, DALYs needed to be calculated. One DALY is a year of healthy life that is lost due to the disease. The number of DALYs in a specific population is an indication of the state of healthcare in that population. The more DALYs lost in a country, the poorer the national health situation. The WHO definition of DALYs is the sum of years of potential life lost (YLL) due to premature mortality and the years of productive life lost due to disability (YLD). To calculate the YLL, we subtracted the average age of death (2 years) from the SA life expectancy (59.55 years). To calculate the annual estimated number of life years lost due to early death if no treatment was provided, the difference was multiplied by the annual number of nephroblastoma cases in SA (61 per year in 2007). The total number was 3 388.6 years. The total YLD was calculated by multiplying the disability weight of nephroblastoma (0.09) with the estimated duration of illness with or without treatment (1 year). The Global Burden of Disease working group has determined disability weights of various diseases. A score of 1 indicates perfect health and 0 indicates death. Ethics approval was obtained from the relevant human ethics research committees of the two participating centres. Patient confidentiality was maintained by using de-identified data. There were 146 patients diagnosed between the two units: 75 males and 71 females (male/female ratio 1.06:1 with an equal distribution between the two units. The median age was 39 (range 3 - 167) months. At diagnosis, there were 99 cases with localised disease, of which 6 were bilateral, 36 had metastatic disease and 5 patients did not have staging investigations. The most common stages post surgery were stage 1 (50%) and stage IV (23%). Stages II and III had a similar incidence of about 10%. Stage V (bilateral) was seen in only 4% of patients. There were five children in whom the stage was not performed or it was unknown. We classified stages I and II as early disease and stages III and IV as late stage (more advanced disease) for practical reasons. Despite the fact that the treatment protocols of stages III and IV are not the same, both stages deal with advanced disease and a more reserved survival rate. Overall, 78.3% of patients with early-stage disease survived, while only 47.3% of patients with advanced-stage disease survived. The cost of various tests, procedures and chemotherapy were divided into early-stage (of which stage I intermediate risk formed the largest part) and v. advanced-stage disease, represented by stage IV disease, which received the most intensive treatment (Table 2). The cost of each stage was calculated first by utilising MRI for diagnosis and then without MRI. The costs of investigations included full blood and differential counts and electrolytes (renal function), both tested 10 times for early stage (prior to every chemotherapy course (8), once pre- and postoperatively) and 19 times for advanced disease (prior to every treatment course (17), as well as once pre- and postoperatively). We also included liver function tests (performed at diagnosis and on completion of therapy for uncomplicated stage I patients and three times for stage IV patients), an HIV enzyme-linked immunosorbent assay (ELISA) and viral serology (Epstein-Barr, cytomegalovirus and hepatitis A, B and C), which are routinely performed by the units. An echocardiogram was performed to assess the initial cardiac function and included at the beginning of treatment. The cost of the chemotherapy was calculated taking into consideration a typical 3-year-old patient (based on the average age at presentation) with a body weight of 15 kg and a body surface area of 0.5 m2. Chemotherapy for stage I patients was calculated as for intermediate risk (IR) patients, since this was the most common risk group, and for stage IV patients receiving SIOP stage IV arm B chemotherapy (Table 1). The total cost of chemotherapy for a stage I IR patient was ZAR1 813.28 (EUR172 or USD213): the preoperative phase cost was estimated at ZAR1 157.40 (EUR109.80 or USD136) and the postoperative cost at ZAR655.80 (EUR62.20 or USD77.10). For a stage IV patient, the total cost was ZAR6 748.92 (EUR640.30 or USD793.10), of which the preoperative phase cost ZAR1 876.32 (EUR178 or USD220.50) and the postoperative phase cost ZAR4 872.60 (EUR462.30 or USD572.60). The number of DALYs lost without treatment was 32 (3% discounting). If a monetary value equal to once the GDP was spent on an intervention in order to avert 1 DALY, it is considered very cost-effective. If three or more times the GDP was spent to avert 1 DALY, the intervention is considered to be cost-effective. SA's GDP per capita is USD7 508,5 thus treating one child with stage I nephroblastoma costs less than once the GDP, making the treatment very cost-effective. Even treating a child with stage IV nephroblastoma is very cost-effective, since more than 32 DALYs were averted by spending only 40% more than three times the GDP. Nephroblastoma is the 4th most common childhood malignancy in SA.8 This is the first report analysing the cost of treating nephroblastoma in a middle-income country. This analysis shows the difference in the cost of treatment between early and advanced disease (5.2-fold increase). This variation in cost is mainly attributed to the more expensive postoperative treatment required for stage IV, which includes radiotherapy and more intensive chemotherapy. Chemotherapy for stage I IR disease comprises two drugs for 8 weeks, where actinomycin D (ACD) boluses are given preoperatively in weeks 1 and 3 and vincristine (VCR) in weeks 1 - 4; postoperatively, ACD is administered in week 2 and VCR again in weeks 1 - 4. In contrast, stage IV SIOP arm B treatment requires six drugs for 34 weeks: in the preoperative phase, ACD is given at weeks 1, 3 and 5, and VCR weekly in weeks 1 - 6; postoperatively, a patient will receive cyclophosphamide and doxorubicin on days 1 - 3 of weeks 1, 7, 19 and 31, as well as etoposide and carboplatin on days 1 - 3 of weeks 4, 10, 13, 16, 22, 25, 28 and 34. Using MRI as a diagnostic modality increased the cost of treating a stage I patient by R4 660.00 (EUR 754.90 or USD 547.60). Lung metastases can be excluded on a CXR, since lesions that are not noticeable on a CXR do not impact significantly on the patient's prognosis. [1 0,11] A CT chest in the evaluation of response in obvious metastasis could be used, and if there is complete response to chemotherapy, then pulmonary radiation could be avoided, with less cost. A search of the literature for the costs of treating other childhood cancers found that several studies evaluated certain aspects of cancer treatment, e.g. use of filgrastim or central venous catheters, but very few focused on the total direct costs of the treatment. A few studies evaluating the cost of acute lymphoblastic leukaemia (ALL) treatment were found.12 ,13 The highest cost was reported by Rae et al.,14 where the total cost for the German Berlin-Frankfurt-Munster ALL protocol ranged from USD40 559 to USD255 987 and for the American Dana-Farber Cancer Institute protocol from USD43 242 to USD262 541. We suggest limiting the investigations for early- and late-stage nephroblastoma patients to the following (Table 3): stage I patients would need an initial diagnostic abdominal ultrasound, and it would be prudent to repeat another preoperatively. Blood investigations may be limited to an initial HIV ELISA, full blood and differential counts, and renal function tests prior to every chemotherapy administration (2 during the preoperative phase, 1 preoperatively, 1 postoperatively and 2 during postoperative phase). Liver function tests should be performed twice in the preoperative phase: at diagnosis and on completion of the phase. Baseline hepatitis testing may be performed. In countries with a high tuberculosis burden, a tuberculin skin test (Mantoux) is necessary to help exclude active tuberculosis. Lung metastases can be excluded by performing one chest radiograph. Stage IV patients should have an initial CT scan of the chest to better identify the size and location of metastatic lesions. If all lesions have disappeared on a follow-up chest radiograph, then a follow-up CT scan would be unnecessary. These patients should also have an echocardiogram as a safety measure before anthracycline drugs are administered. 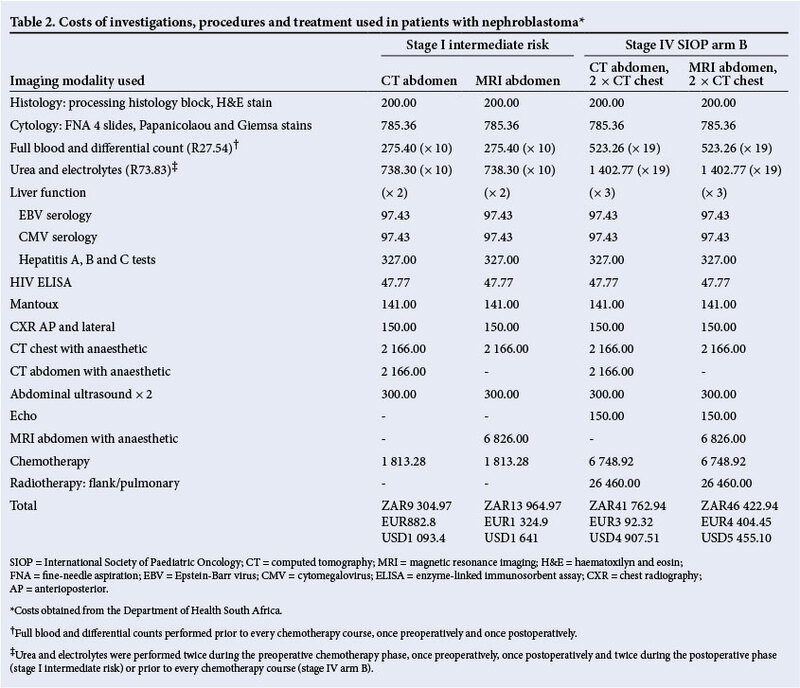 In comparison with a stage I patient who has had investigations including CT and MRI scans, as in Table 2, this would bring down the cost of the investigation and treatment of stage I patients to only ZAR3 587.27 (EUR340.30 or USD421.50) - a 61.4% reduction in cost. There would be a 19.7% reduction for comparative stage IV patient groups (Table 3). This study is the first to conduct an ingredient-based costing analysis, and to determine the specific costs associated with diagnosis and treatment of nephroblastoma - one of the most common childhood cancers in Africa - using real cost and patient data. The costing methodology used ensures ease of replication in different settings and transparency of results. Furthermore, results from this study can be very useful to inform future cost-effectiveness studies. The first limitation is the perspective taken for this costing study, i.e. calculating strictly only the costs related to staging, diagnosis, investigations and treatment. Wider societal costs, such as out-of-pocket expenses incurred to patients and their families as a result of the illness were not included, as this was beyond the scope of this research. This study did not take into consideration the cost of staff (salaries) or hospitalisation time due to complications or treatment, or the cost of follow-up visits and investigations. Disposables, other equipment costs and surgical/theatre costs were also excluded from the analysis. Despite these limitations, this analysis offers policymakers the first empirical estimates of the total costs to the health service of treating a child with nephroblastoma in two provinces in SA. In a country such as SA, with a relatively small GDP per capita (USD7 508) and other priorities such as AIDS and TB competing for the healthcare budget, the anticipated high costs associated with cancer treatment might be a daunting investment. This study shows that nephroblastoma is a cost-effective cancer to treat, especially when intervening early (when treatment requires less intense chemotherapy and no radiotherapy). Therefore, this study could be used to educate the population and primary healthcare providers on the benefits of early diagnosis and treatment. Generalisation must be made with caution though, as this study is based on data from two SA units only, which may not reflect the costs and treatment regimens in different countries. It could nevertheless be useful to raise awareness around childhood cancer in the country as well as in other parts of Africa. This study could also be used as the start of a more comprehensive project involving representatives from all African regions and international specialists looking at the cost and cost-effectiveness of treating nephroblastoma and other cancers on our continent. In November 2013, such a network was formed under the auspices of AORTIC (African Organisation for Research and Training in Cancer), the African Cancer Economics Network. The objectives of this network are, among others, to improve the knowledge about the cost of cancer care and cost-effectiveness in Africa. A further objective is to play a facilitator role for the advancement of cancer-related health economics and policymaking capabilities on the African continent. Although this study provides new useful information regarding the costs of treating nephroblastoma in SA, these results should be incorporated into a full economic evaluation in order to provide a better picture of the health benefits and costs of nephroblastoma treatment at different stages of the malignancy. In high-income countries, the total cost of treatment of nephroblastoma is relatively cheap, but in many African countries and for numerous patients, treatment remains unaffordable. It is a highly curable disease and very cost-effective to treat. It is essential to increase awareness about childhood cancer, specifically nephroblastoma, in order to diagnose children earlier, since this will not only reduce costs, but more importantly will lead to improved survival rates. Acknowledgments.We acknowledge Prof. Susan Horton from Balsillie School of International Affairs, University of Waterloo, Canada, for the professional guidance in health economics and Mrs R Nortjie, data manager of the SA Paediatric Tumour Registry, for providing the tumour registry data.